The in basket: I encountered Jean Lenihan at the Willows retirement complex in East Bremerton recently, and she said she had been meaning to e-mail me a question for several years. She told me what was on her mind, and it’s a dandy that I had never been asked before or wondered about on my own. Why, Jean asked, are the numbers of state highways radiating out from Highway 3 in Kitsap County not in sequential order? From Bremerton north, you come to Highway 304, then 303, 308 to Keyport and finally 305 to Bainbridge. She didn’t even mention Highway 302 farther south just across the county line, or Highway 300 out to Belfair State Park, both of which intersect Highway 3 in reverse order. The out basket: I recall when I was a kid here the renumbering of our local highways, and the fact that Highway 3 used to be Highway 21. Steve Bennett, traffic operations engineer for this region of state highways, says he has no idea what guided the choosing of numbers. “As these highways were renamed 50 years ago, I doubt there is anyone around here that would,” he said. I don’t think Highway 303 was a state highway until well after the county built it with federal Trident money in the 1970s. It became one about the time the state swapped a bunch of roads with local jurisdictions, notably taking over Sedgwick Road as Highway 160, creating Highway 166 from Gorst to Port Orchard, part of 160’s old route, and leaving the county with the remainder. The state wouldn’t have had a natural choice when it took over 303, as it lay between 304 and 305. About the best we can hope is that some old-timer recalls what the rationale was back in the original renumbering and lets us know. The in basket: Mike Knapp of Keyport asks “What is the story with the reduced speed coming into Keyport from 35 mph to 25 mph just before the traffic light at the base yet the other side of the road is still 35 mph? The out basket: The change was made at the request of the Keyport Improvement Club. Keyport resident Doug Chamberlain, who just stepped down as club president after three years in the position, said the state had studied the need for a lower speed limit there about three years ago. The issue went back on the front burner last year when a club member who takes care of his grandkids said “cars are coming into town too fast, barreling in and out, and that crossing the highway was dangerous,”according to Doug. Though it’s a quiet city street in the town center, it’s still a state highway and the state made the change in November. There is confusion, though, about what the speed limit is at various points, as evidenced by Mike’s assertion that it’s still 35 going out of town. It isn’t supposed to be, says state Traffic Operations Engineer Steve Bennett and Doug Chamberlain. It’s supposed to be 25 in both directions from just north of the traffic signal at the Navy base entrance to the end of the highway, 35 in both directions from there across the causeway and 50 beyond that. Steve said they’ll check on the signs to see if they’re where they should be. If Mike really has trouble getting slowed from 35mph to 25 as he comes into town, he may be an example of what prompted the improvement club to seek the reduction. While I had Doug on the line, I asked about the parking area just outside the Navy base’s old main gate at the highway’s end, about which a reader complained years ago. It’s narrow, designed for one-way traffic and tapers to the point that a car parked at its end makes it hard for other cars to get past and leave. There’s a “Motorcycles Only” sign at the narrow end but it sometimes isn’t observed. Doug said the club is aware of it, but has taken no action beyond asking the base to encourage employees to honor the “Motorcycles Only” sign. The state owns the spot but it’s uncertain who put up the sign, Doug said. The in basket: Greaves Way, the link between Highway 303 and Old Frontier Road northwest of Silverdale. has inspired a couple of questions from Peter Wimmer of Silverdale. And two, he said, when he asked the Road Warrior column about the fancy lighting on that road a couple years ago, “the project engineer said that it was done (because) it was the ‘Gateway to Silverdale.’ Then at the Dec. 21 Central Kitsap Community Council meeting where Tina Nelson (senior project manager for the county), gave the brief on the Silverdale Way roundabout and Bucklin Hill Road bridge project, I asked about the lighting and she said that it was going to be the standard grey metal pole lighting. The out basket: Peter’s first question implies that the Greaves Way landscaping was planted and forgotten, but Don Schultz, county road superintendent , says that’s not the case. Tina Nelson took the second question, and said, “There has been, and continues to be, discussion with the Central Kitsap Community Council (CKCC) about using the center of the roundabout for a ‘feature’ (a gateway in a sense) to welcome motorists to Silverdale. The decision was made to include minor work within the center (including the wall with the Welcome to Silverdale letters) in the current construction project, and work later on a ‘feature.’ The feature could include art, plants, something by the community, a competition, or other ideas being considered by the CKCC. 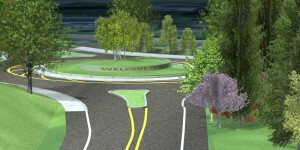 “The construction plan is to provide the required lighting that meets (state) standards for safety for the roundabout. The current plan specifies standard (state) light poles. This is county standard for projects if we can’t hang luminaries from existing power poles. The standard poles meet safety specifications, and allow us to use existing inventory parts for any maintenance required. This keeps maintenance costs lower. “We listened to feedback provided at the December CKCC meeting. We are reviewing the possibility of installing light poles more decorative than the standard poles currently in the project design. The in basket: Larry Avery, Jeff David and Robert Balcomb have posed the latest questions to the Road Warrior column about the new Manette Bridge in Bremerton. Larry said on Dec. 29, “(I) was at the Boat Shed this afternoon and it doesn’t seem like anything has happened there in some time. “Sure, they have been working on the demo of our old bridge, but has the state let the contractor slide on getting the final work done on the new bridge? Robert writes, “There was a plan circulated around town concerned with turning the old Manette Bridge into a People’s Bridge, such as for abandoned traffic and railroad bridges in America and Europe. The out basket: Jeff Cook, the state’s project engineer on the bridge replacement, said on Dec. 30, “The demolition of the old Manette Bridge has been the most noticeable operation over the last six weeks, however a great deal more has been ongoing as well, some which cannot be seen from the south side. “The overhang brackets that supported the barrier and deck construction of the north side of the bridge are completing the removal process. “The massive beams which supported the construction of the first span on west side took several weeks to unfasten and remove. ‘”Grading operations for the east and west banks were completed and the expanded viewscape construction is nearly complete with only planting remaining. “At any given time there have been three to five separate operations occurring beyond the … demolition. “So the next question will likely be: What’s left? – “The contractor will complete the demolition of the two remaining concrete piers; both on the east side in the beach area. This is tidally dependent, will be at night, and likely complete by the middle of January. – “The contractor has been awaiting the final shipments of green railing to be installed on the south side of the bridge. A fabrication issue delayed the delivery, but the remaining materials are scheduled to be on site then in place by the end of January. Once installed, the sidewalk will be open to the full 10-foot width.” Gaps in the north side rail also have awaited the overdue pieces, he said. – “Planting for the viewscape and the center of the roundabout will complete approximately the middle of January. -“The last work under this contract will be the application of pigmented sealer to the girder faces and end piers. (The public will generally see this as ‘painting’). “(It) must occur when the temperature is consistently above 50 degrees and not raining. “What will likely happen is all the work above will complete, the contractor will leave the site, then return in April to complete the pigmented sealing of the bridge. This work will take approximately three weeks and will be conducted from barges. Answers to Jeff David’s and Robert’s questions are found in the “frequently asked questions” segment of the state’s Manette Bridge Web site at www.wsdot.wa.gov/Projects/SR303/ManetteBridgeReplacement/FAQ.htm. A roundabout connection to Shore Drive would have been too steep, so wasn’t built, it says. Due to the deteriorated condition of the old bridge, it would present a real risk to the new bridge during a major earthquake, if left in place, it also said.